To skip the narrative and go straight to signing up, click here. In 2015 we made the difficult decision to postpone production at Wind Whipped Farm and not run The Local Food Box program. We needed to make some significant soil and infrastructure improvements to increase and better manage production. We knew we would miss the rhythm and rewards of growing food as well as the many great people we know through our box program. We were also concerned that we would lose touch with our members and, as a result, would have to rebuild our momentum and reputation all over again. We launched the box program registration in early spring with a conservative target of 50 vegetable shares. We knew we could count on some very loyal and enthusiastic supporters, but questioned whether we could reach our target by June, when harvest was scheduled to start. Within six hours of announcing that registration was open, we sold 25 shares. Within twenty-four hours, 40 sold. Three days after launching we reached our target of 50 boxes. We started a wait list, revised our crop plans and decided to take on another 20 veggie shares. We are really encouraged by the response and grateful for the support. Thank you to our members who value good local food and appreciate the people who produce it. Overall we are very happy with the 2016 season. We extended the season by 4 weeks up to 20 weeks. On average, we provided veggie box members with over $35 of vegetables per week (for the price of $30 per week). We sold a total of 30 bi-weekly meat boxes, and 24 weekly dozen eggs (it was a challenge to meet the demand for eggs! We’re working on increasing egg supply for 2017). Our new field drainage really helped extend our growing season, and our new workshop and walk-in cooler give us more space to clean and store more food. We also built a second small greenhouse to start more seedlings in late winter and early spring, and to grow more heat loving crops in the summer. Thanks to the ongoing support of box members and with the farm improvements we made, we are confident in our capacity to improve and increase production in 2017 and beyond. The Wind Whipped Farm new seedling greenhouse and the workshop in construction. 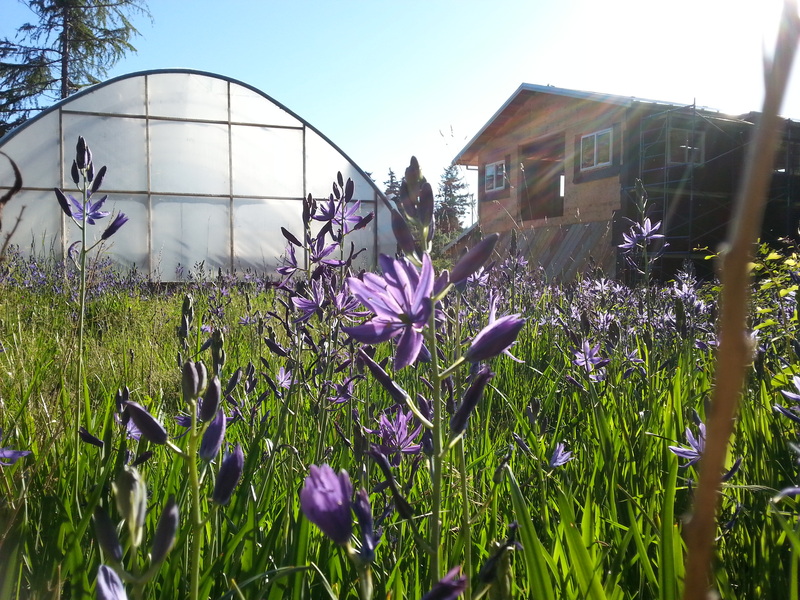 Offering a flower CSA: The talented Lorna Jackson from Ninebark Farm is offering fresh-cut seasonal floral bouquets grown and designed in Metchosin. Bouquets are available on a bi-weekly basis and cost on average $15 each, for a total seasonal value of $150. A great Christmas present! New crops: Garlic is already planted, we plan to give baby ginger (another) chance, and to experiment with sweet potatoes and hot peppers. Different day and times for our Victoria box pick-ups: To better manage our harvest and minimize driving, we will be in town on Tuesdays only. Boxes will still be available at both the Cook St Village Activity Centre and the VicWest Community Centre. Hosting an on-farm event: We’re not sure what or when, but we know we want to make it happen sometime in 2017. We are now accepting registrations for the 2017 season. To give the gift of good local food (or flowers!) this holiday season, or to secure your space for next year, register here. More information on the box program is available here, or in Frequently Asked Questions. Please help us spread the word! We wish you all the best for the holidays. If you are looking to purchase a U-Cut or Live Potted Christmas Tree, please visit Winter Creek Farm. Thanks again for your support in 2016. As always, please get in touch if you have any questions, comments or suggestions.